It is amazing to me how the right tool for the job can make a heap o’ difference to the outcome. And that tool doesn’t have to be super-fancy or expensive – just well thought out, sturdy and adaptable. These are exactly the qualities (among many others) that my partner possesses. 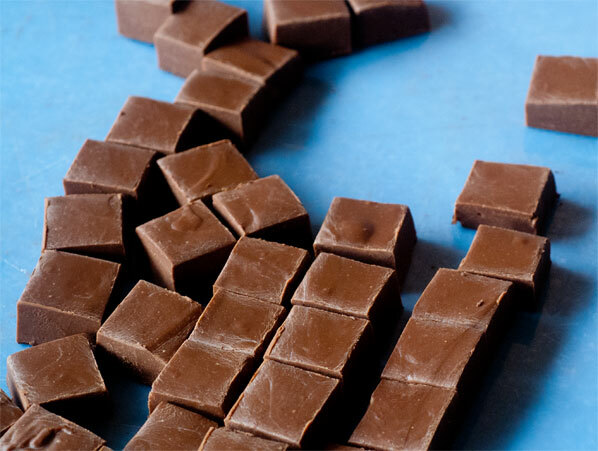 So it is no surprise that this post is dedicated to him and the new toy he made for me: a brand new, custom built chocolate dipping “Cheatar”. I really don’t know the proper name for it, and don’t think this does it justice, but essentially, this is what it is: a thin stainless steel guitar string, strung at a 45 degree angle, across a the top of a right angle (90 degree) aluminium housing, which is tall enough to slide over the corner of the bowl or melter, in which tempered chocolate sits. 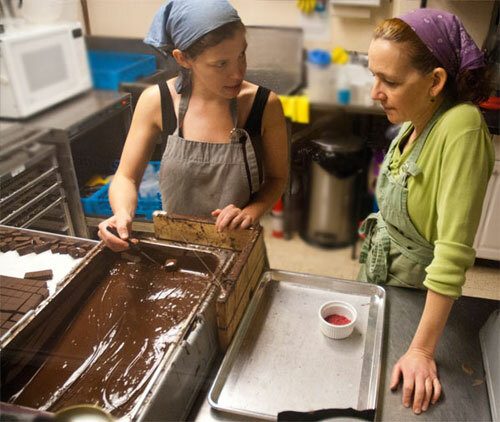 I got to spend a day last week, being a real chocolate apprentice at Rachel Sawatzky’s Cocoa Nymph. In that day of soaking in Jen (my mentor teacher) and Rachel’s expertise, my confidence in my rudimentary enrobing skills increased one hundredfold. 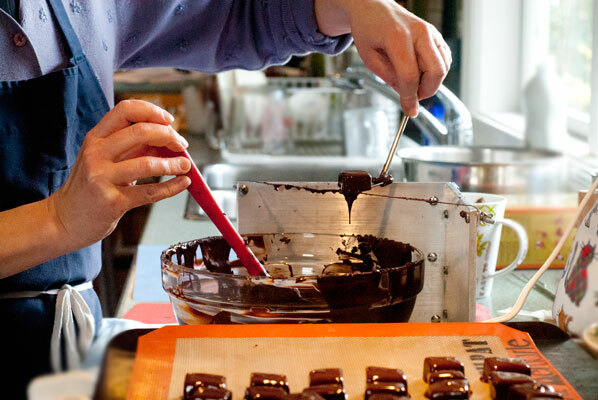 Among the many opportunities I had that day, was the chance to work with large amounts of chocolate, accurate melters, lots of space, and some very sensible practices for setting up the space for maximum efficiency and flow. This is where I first heard Rachel refer to the dandy device they call a “Cheatar”. 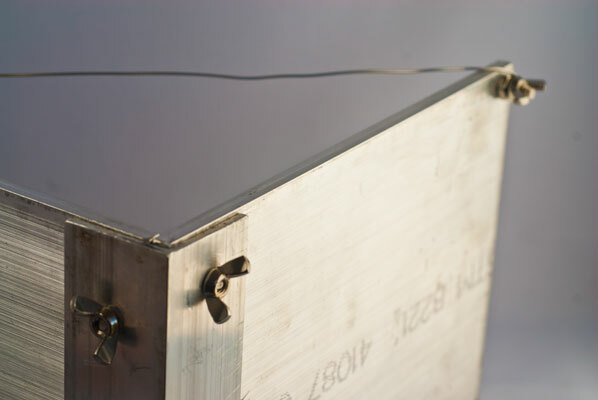 Hers is huge, sturdy, and made of wood, with a stainless steel wire. I looked forward to bringing these skills back to my own kitchen to see if the knowledge would transfer with me. I have a batch of milk chocolate mango ganache, which has been crystallizing, and after a quick check, appears a good consistency for my enrobing attempt. I poured this ganache out for crystallization “free hand”, so the edges will need to be trimmed, but I hope there will not be too much waste. 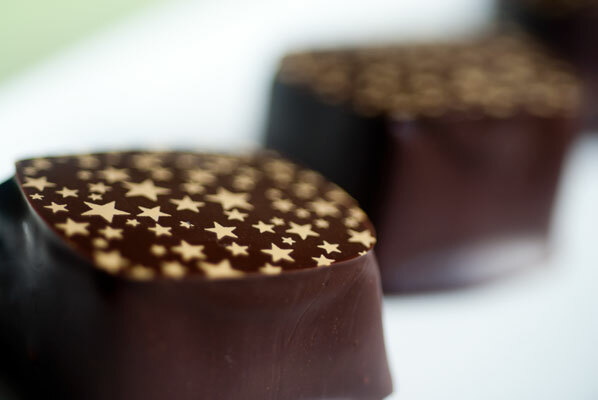 I am using my wonderfully easy-to-use (Cacao Barry Tanzanie Origine rare 75 %) dark chocolate pistoles to enrobe today. The aroma, as soon as I open the box is rich and fruity. I think this is going to be a good choice. 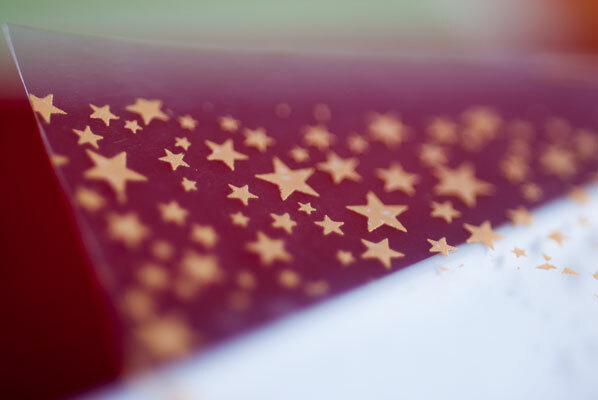 Once the chocolate has been tempered (and I have done a test strip on parchment), I bottom the sheet of ganache. I spread a thin layer of the tempered chocolate completely over its bottom surface (I have flipped the whole thing over for this). 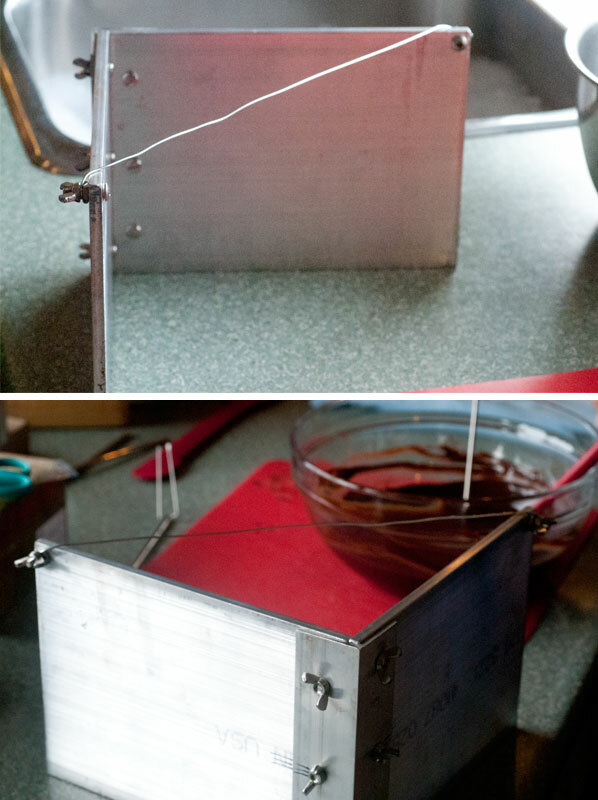 When this has set up (ah, good it has set quickly – I hope this means the chocolate has remained in good temper), I flip it back over and trim the edges with a pizza wheel. Since I don’t have a guitar cutter, and this is such a small amount, I cut the strips by hand with the pizza wheel, then cut those strips into cubes. Not quite as uniform as the ones at Cocoa Nymph, but I am ready to roll. Following Rachel’s advice for good flow, I set my station up, and bend the prongs of my dipping fork to a 45 degree off-set angle, to enable easier dipping and release. Why didn’t I think of this before? Intimidation by tools, I think. But now I know what I need, and am a little less afraid to “adapt as needed”. And now, time for the fabulous Cheater, which I slide over the bottom left-hand corner of the bowl. I have far less “wiggle room” than with the huge trays of chocolate at Cocoa Nymph, but everything looks fine for the small amount of ganache I am dipping, today. I drop in the first cube. 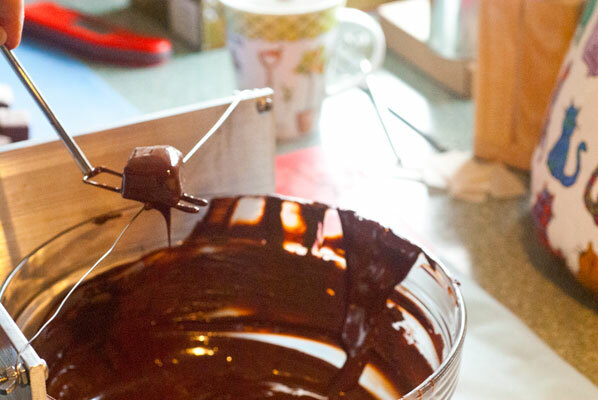 I flick the chocolate over the top surface of the ganache with the fork. 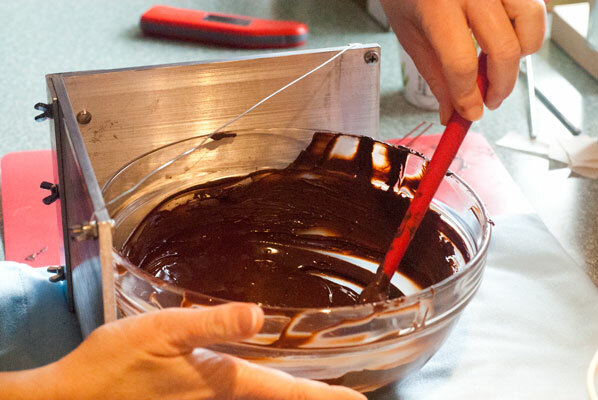 The bottom sheet of chocolate I put on really helps to keep fork marks out of the ganache, as I lift the cube onto the fork, and the technique of slapping the surface of the chocolate five times with the enrobed ganache, to pull the chocolate down the sides, is working like a charm. Much better than tapping it on the edge of the bowl. It doesn’t take long to realize that I have got things completely turned around, and that in fact, it is far more efficient for me to slide the Cheatar onto the UPPER left hand corner of the bowl. 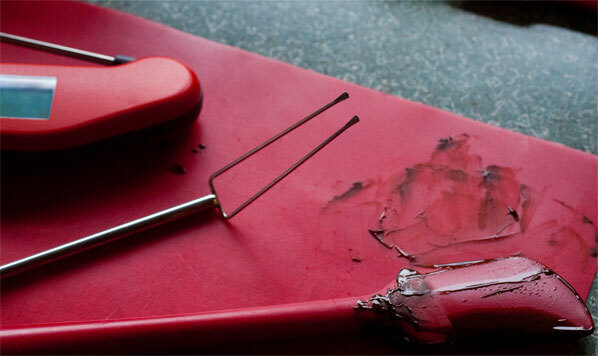 Seems like a small thing, I know, but it makes all the difference when time is of the essence, and one is balancing a hardening chocolate on the dipping forks. 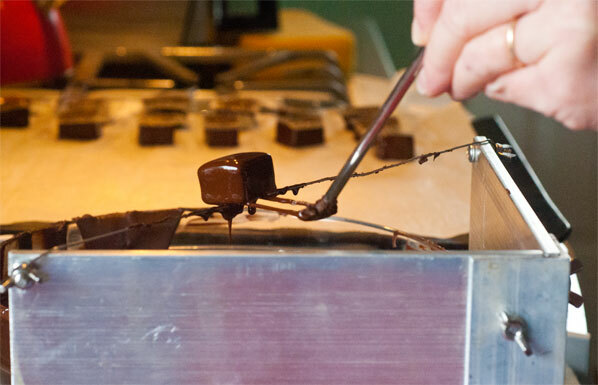 I find that the best technique for me to use the Cheatar is to drag the enrobed chocolate over the wire, up and to the left, before depositing it on the tray. I think many right-handed people would find this completely opposite to what feels comfortable for them, but we Lefties are a little different. You just have to play around to find out what works for your body, since working with chocolate really is a whole body experience. I still need practice on releasing the bonbon from the dipping fork, but I notice the “skirts” and pooling are much less pronounced, with the Cheatar taking the excess chocolate off the bottom. 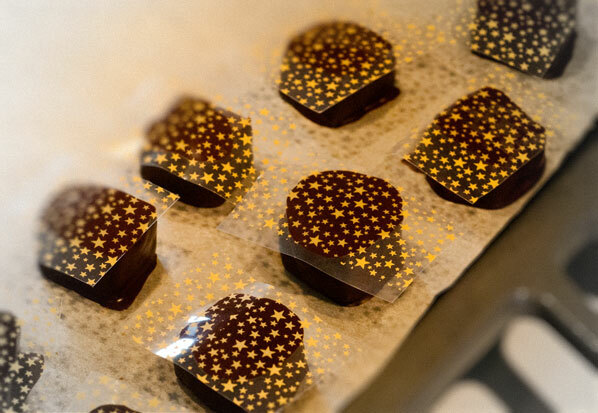 Rachel was kind enough to give me a transfer sheet of little gold stars, and my partner is pressed into service to cut the sheet into small squares, to fit the top of each piece of enrobed ganache. 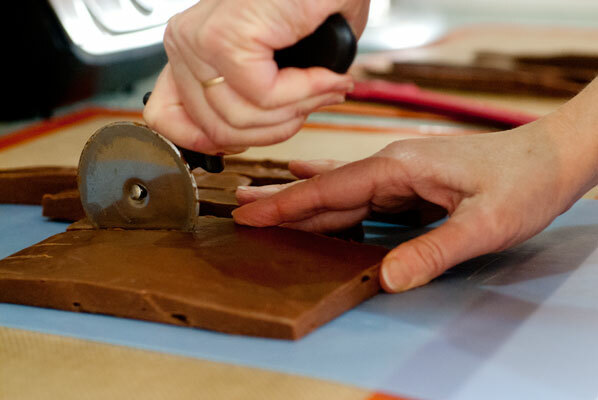 There is a neat little tool I suddenly covet, which I saw on an Ecole Chocolat instructional video. It looks like a tiny hand sander. It is in fact, a flat surface with a handle, and a little bit of sponge on the surface. 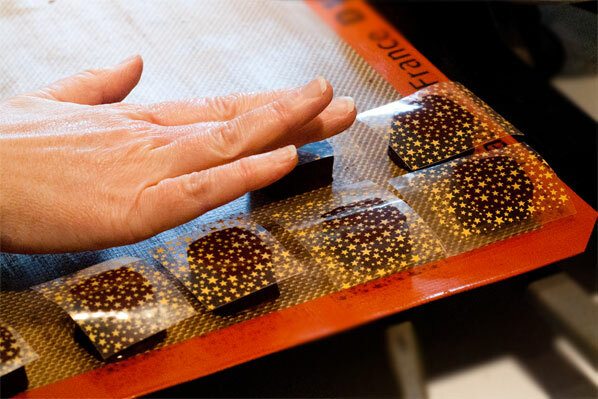 This enables you to gently but firmly press down on the entire top of the chocolate, once you have placed on transfer sheet, for a uniform surface. We do not have one of these neat devices – yet. We make do with our fingers, some swearing and a lot of laughter. 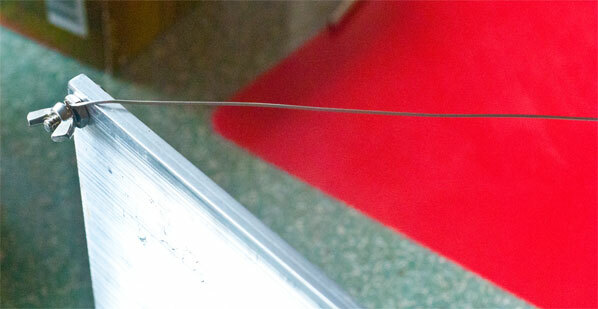 We are very pleased with our results as we pull them carefully off, once the bonbons have hardened. 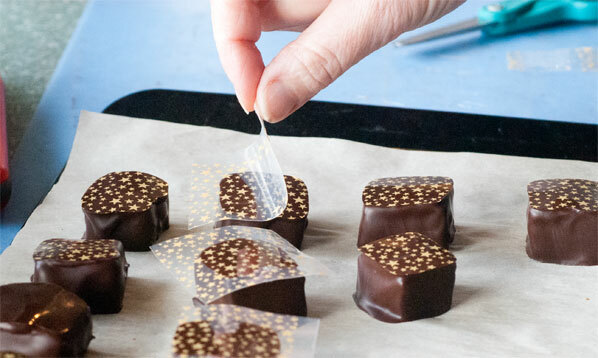 And when we discover that yes, in fact, I have put one on upside down (cocoa butter side up), it still creates a nice, shiny surface, and leaves one extra piece of transfer sheet for another bonbon. 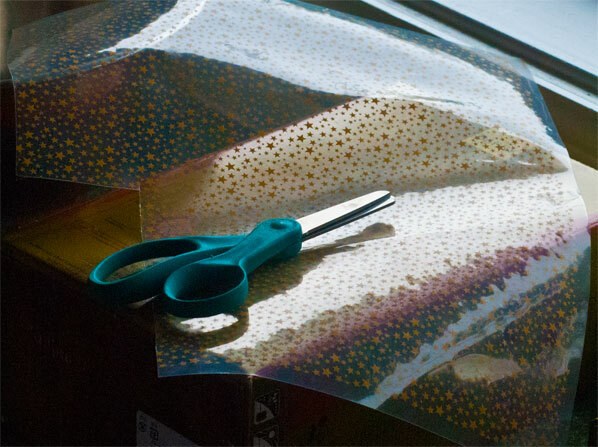 The great thing about transfer sheets is that they do hide a lot of mistakes, and make for an elegant finish. 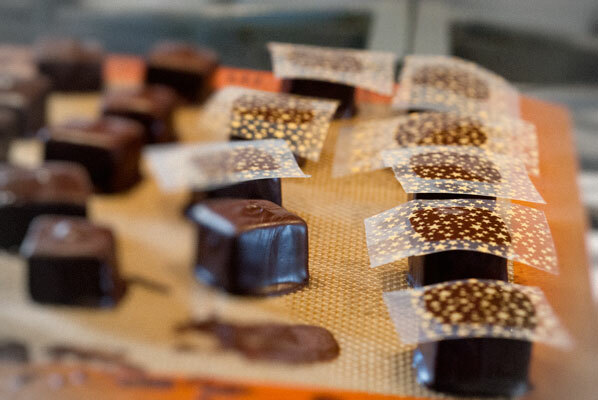 Clearly, I need to spend much more time working with transfer sheets, and decorations for the tops of the chocolates, now that I feel more confident in the actual dipping/enrobing process. A few simple technique tips, an adaptation or two, lots of practice and one good natured partner who doesn’t mind getting chocolate on his hands and I feel one hundred times more confident. And, of course, I love my new toy.